Welcome to the Ancora Easter Bible Comic! Here you'll find the story of Easter, together with fun facts, quizzes and codes to help you discover what the Easter story is all about! With each part of the story you'll find a Bible reference. This tells you where to find the story in the Bible - God's book. The comic is based around the theme of Scripture Union's groundbreaking tablet game, Guardians of Ancora. The Ancora Easter Bible Comic by Various Authors was published by Scripture Union Publishing in December 2015 and is our 346th best seller. The ISBN for The Ancora Easter Bible Comic is 9781785062681. Be the first to review The Ancora Easter Bible Comic! Got a question? No problem! 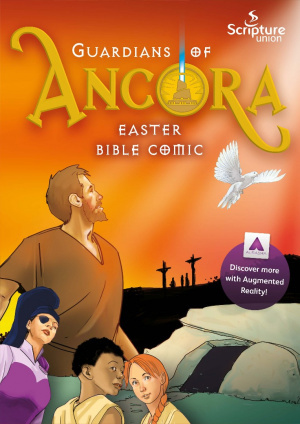 Just click here to ask us about The Ancora Easter Bible Comic. I have 2 Grandchildren one 13, one 10, a boy and girl, would this comic be suitable for both.Neither have Bible knowledge. M.E. Green.